Forty days before the Triduum, the Lenten season disposes Catechumens and the faithful to celebrate the paschal mystery through prayer and penitential practices. As we celebrate the Solemnity of the Annunciation this week on March 25, it is appropriate that we choose Mary, the greatest and first among all of our saints, as our Saint of the Week. Mary did not immediately think of herself, but set out to visit her cousin, Elizabeth, to be with her at the birth of John the Baptist. We will celebrate this unselfish act on May 31, the Visitation. Mary's message today: Our greatest saint, Mary did one simple thing. 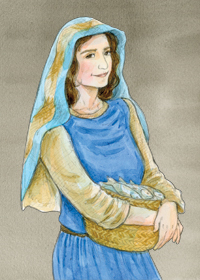 She listened to God’s will—that she was to be the mother of Jesus—and she accepted God’s will. Have you accepted God’s will in your life? Pray for an understanding of what God is calling you to do?